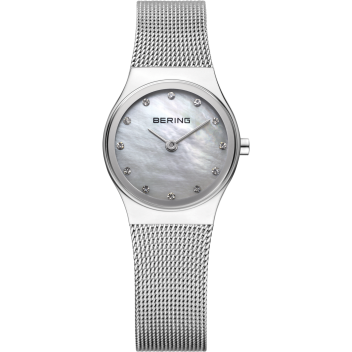 The cool steel colour of this watch from Bering certainly evokes the harsh and arctic lands that Bering takes its inspiration from. The dial is plain, except for the twelve sparkling Swarovski Crystals that indicate the hours. The mesh strap is in the same elegant style of the dial, whilst the Miyota 1M12 movement is smooth and quiet. This watch has a subtle, but distinctive elegance about it, a quality of all Bering designs.